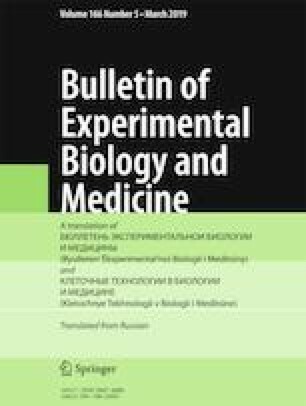 We studied dynamic changes in the total number of cardiomyocytes and the character of structural lesions in the myocardium in rats with modeled anthracycline-induced cardiomyopathy provoked by a single injection of doxorubicin in a dose of 10 mg/kg alone or in combination with subsequent adrenergic stimulation. The injections of epinephrine during the development of anthracycline-induced cardiomyopathy resulted in more pronounced loss of body weight, stronger decrement of the heart weight, and more severe decrease of the cardiomyocyte count in comparison with the corresponding changes induced by doxorubicin alone. The basic lesions of cardiomyocytes in anthracycline-induced cardiomyopathy are the lytic alterations and subsegmental contractures; in contrast, combined use of doxorubicin and epinephrine provoked degree II and III contractures. The revealed necrobiotic changes of cardiomyocytes resulted in their death and pronounced decrease of their number at the initial terms of the study. Hypertrophy observed at later terms of the experiments in parallel with partial recovery of cardiomyocyte number reflected the development of regenerative and adaptivecompensatory processes induced by massive death and elimination of the parenchymatous cells (up to 36-37% of population). Chang YT, Huang WC, Cheng CC, Ke MW, Tsai JS, Hung YM, Huang YM, Huang MS, Wann SR. Effects of epinephrine on heart rate variability and cytokines in a rat sepsis model. Bosn. J. Basic Med. Sci. 2018. doi: https://doi.org/10.17305/bjbms.2018.3565.